Several studies have associated high body mass index (BMI) with increased breast cancer risk, so scientists wanted to see if losing weight reversed it. Four out of five cases of breast cancer occur after the menopause, according to the charity Breast Cancer Now, which said women could significantly reduce their risk by following a healthy lifestyle. The American study analysed data from more than 60,000 women and found that over 3,000 developed invasive breast cancer over the following 11-12 years. Compared with women with stable weight, those who had a 5 per cent or more decrease in weight were 12 per cent less likely to develop breast cancer. A weight loss of 15 per cent or more was associated with a 37 per cent reduction. The research, being presented at the 2017 San Antonio Breast Cancer Symposium, was led by Professor Rowan Chlebowski, of the Department of Medical Oncology and Therapeutics Research at City of Hope in Duarte, California. He said: "In the three-year window of the study, relatively modest weight loss was associated with significant lowering of breast cancer incidence. "From this study, we have evidence that a weight loss strategy can be effective in lowering breast cancer risk in postmenopausal women." They looked at participants who had a normal mammogram, no prior breast cancer, and were not underweight, taking measurements for height and weight at the start and three years later. To start with, 41 per cent of the women were normal weight, 34 per cent were overweight, and 25 per cent were obese. While a weight gain of 5 per cent or more was not associated with an increased overall breast cancer risk, it was linked to a more than 50 per cent increased risk of triple-negative breast cancer. 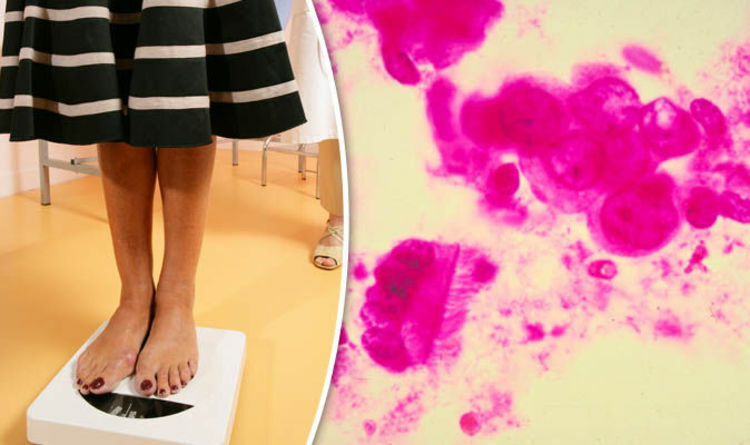 Baroness Delyth Morgan, chief executive at Breast Cancer Now, said: "This important study provides further, clear evidence that postmenopausal women can significantly reduce their risk of breast cancer by taking steps to lose weight. "Being overweight after the menopause does increase your risk of the disease, likely because fat tissue becomes a women's main source of oestrogen after the menopause. "The less body fat you have, the lower your oestrogen levels, which can decrease your breast cancer risk. "With breast cancer incidence continuing to rise, we need to do much more to enable women and men of all ages to reduce their risk. "It's so important to remember that we can all reduce our breast cancer risk through various lifestyle factors, including keeping physically active, maintaining a healthy weight throughout life and lowering our alcohol intake."